Red-eye gravy is an old recipe that was made by our grandparents and their parents and so on. While it might not be true, the rumor that President Andrew Jackson named this gravy for his moonshine-loving cook is too good to dismiss. Place ham in a large bowl, and add enough warm water to cover. Let stand for 10 minutes. Remove ham from water, and pat dry. In a large skillet, melt butter over medium heat. Add ham, and cook until crisp, approximately 3 minutes per side. Remove to a plate, and keep warm. Stir in flour, and cook until lightly brown, approximately 1 minute. Whisk in coffee and chicken broth. Stir in salt and pepper. Serve over ham. 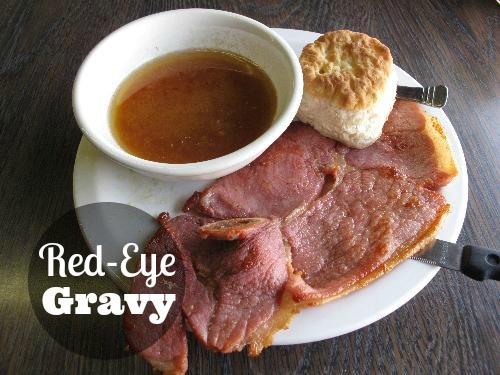 Note: Red-eye Gravy is traditionally made by de-glazing the skillet where ham has been fried with coffee.